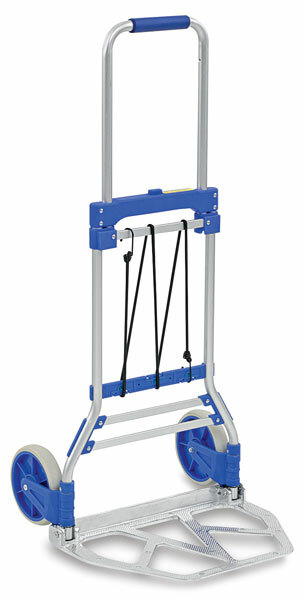 Pointe compact transport hand trucks fold up with the push of a button for easy stowing and mobility. All feature sturdy aluminum construction and shock absorbing rubber wheels for quiet, secure use in many different environments. Weighs 12 lb yet can carry up to 275 lb. The exceptionally wide 19" × 13-1/2" load pad secures loads for easy movement. Overall dimensions are 43" high × 21" wide × 19-1/2" deep. ™ Pointe is a trademark.